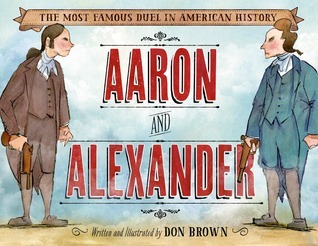 Aaron and Alexander, The Most Famous Duel In American History - written and illustrated by Don Brown. It is interesting to read this book about Aaron Burr and Alexander Hamilton considering the past months of political fighting going in the US today. I knew little about the controversy between Burr and Hamilton, but Dan Brown has written the basic story from birth till Hamilton's tragic death, and shows the passing events through the years with his vibrant watercolor illustrations. Both were patriots and both added to our country's beginnings with positive acts. However both seemed unable to compromise their feelings about each other, which ended in tragedy. For students studying various aspects of the Revolutionary War, this may spark an interest in further research. Brown has added a page of additional information at the back. Yes, it is that, Jane. Even though I knew about these two men, the information told in the story was mostly new to me, and interesting to see that they had similar backgrounds in several ways. Thanks. Thank you for sharing this one. It is also a great mentor text for compare/contrast writing structure. I agree, Alyson. And it makes it that for younger students because the text isn't too dense. Thanks, a nice book! Linda, I'm looking forward to reading this one. I just downloaded the soundtrack of the musical "Hamilton." The music is amazing, but so is the story of Hamilton's life and his tragic death. I didn't know there was a musical about Hamilton. Considering what information this book shared, the play should be interesting. Glad you saw this review, Laura.